This page provides information about licensing from a practical point of view. If you are interested in the legal aspects, please refer to the Terms and Conditions. The easiest way to obtain a licence for the Tinman 3D SDK is provided by MyCommerce. To do so, click one of the Order buttons below or visit the Tinman 3D SDK product page. Alternatively, you can use the Licence baKErY tool to initiate a purchase. Choose a licence type and start the order process. Provide the metadata to bind your licence key to (see example order form to the right). Receive your licence key via email. Use the Tinman 3D SDK resp. the additional content. Generate licence request filesfor the metadata you need (e.g. tinman_3d.licence-request.user.id-C9F9A1B9.json.txt). Please refer to Licence Requests for details. Lookup your the MyCommerce Order Number (e.g. #537515913). 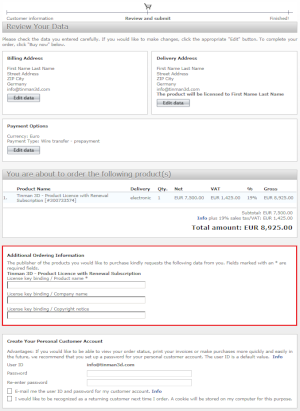 You can find the order number in the purchase notification email and on the invoice document. Send an email to sales@tinman3d.com, including the above information. We handle extra licence key requests manually, so please allow us a couple of workdays to process your request. In most cases, extra licence keys can be issued almost instantly. Please contact sales@tinman3d.com if you have any more questions regarding licensing. Evaluate the Tinman 3D SDK by running the Demo Application executable and browsing its source code. 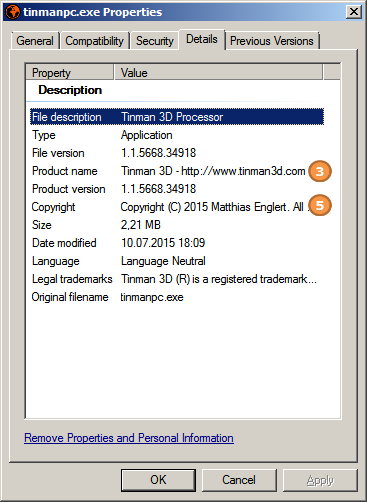 Allows a single user to use the Tinman 3D SDK during the licence period. Choose between either annual subscription (12 months) or short-term use (3 months). Allows use of SDK by licensed user on any machine. Licence keys are bound to user metadata. Allows all users that belong to the licensed company site to use the Tinman 3D SDK during the subscription period. Allows use of SDK by all users on licensed company site on any machine. Licence keys are bound to domain metadata. Allows all users that belong to the licensed academic entity to use the Tinman 3D SDK during the subscription period. Allows use of SDK by all users of licensed academic entity on any machine. Commercial use is not included in this licence. Allows perpetual use of the Tinman 3D SDK in a specific software product. Embed SDK redistributables in licensed product. Licence keys are bound to product metadata. Allows perpetual use of the Tinman 3D SDK in all products of the licence owner. Embed SDK redistributables in any product of the licence owner. Licence keys are bound to company metadata. Allows perpetual use of the Tinman 3D SDK by the licence owner. Embed SDK redistributables in any product of the licence owner or any derived product. Licence keys have no metadata binding. Source code is licensed separately for each programming language (C#, C++). Access is granted to the licence owner. New licence keys will be issued for the prolonged update period. New unlock keys will be issued for the prolonged update period. a) Licence keys are bound to the specified metadata using asymmetric encryption. b) All prices are given in EUR, excluding VAT. You can make payments in any currency supported by MyCommerce, though. c) No separate licence key is necessary, you can start your evaluation right after downloading the Tinman 3D SDK. d) Extra licence keys are issued for free, provided that the bound metadata correlates with the licenced product resp. licence owner. e) Billing period is 1 year = 12 months. f) You will receive an unlock key after completing your order. Please make sure you also download the corresponding SDK packages, if necessary. 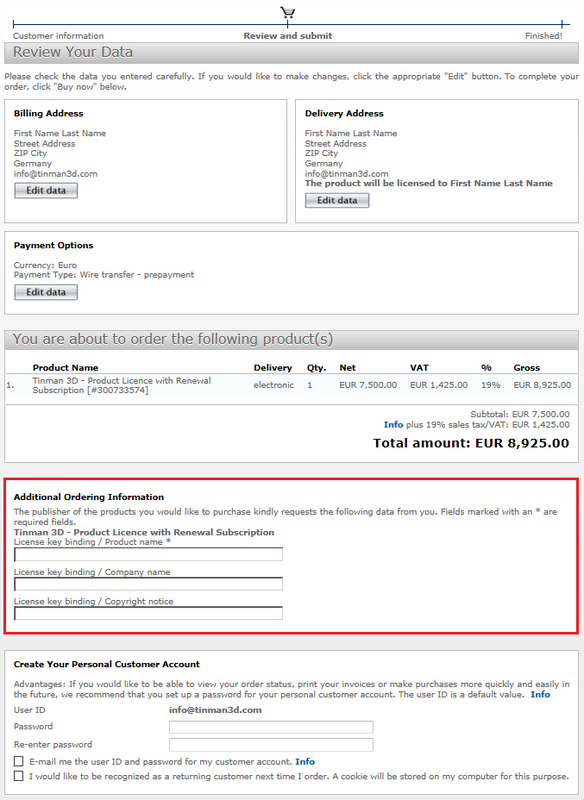 g) Renewals are triggered automatically by your MyCommerce subscription, which you can cancel at any time. Before the Tinman 3D SDK can be used by an application, it must be activated. Activation is done by providing one or more licence keys during application startup. 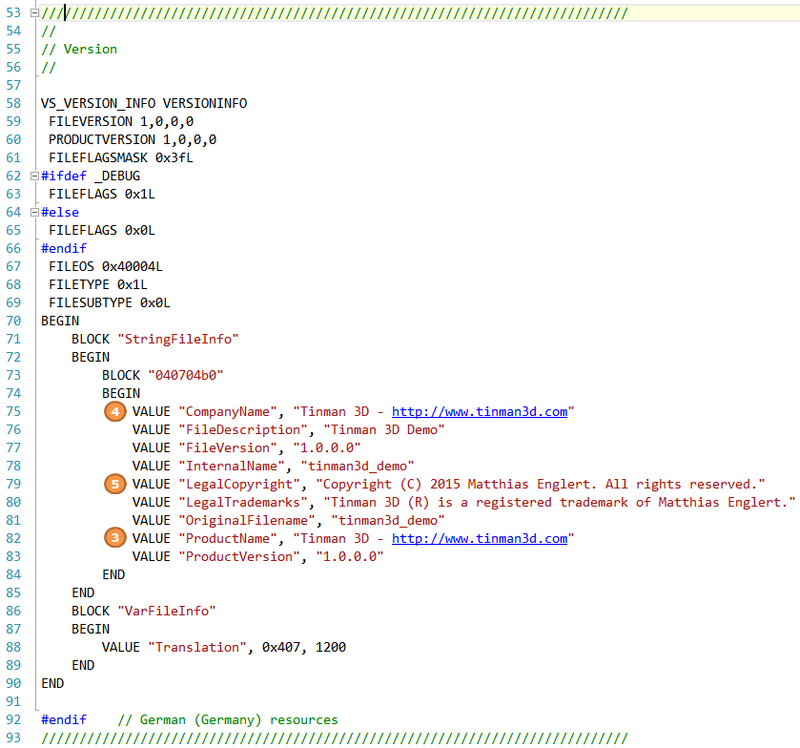 The characters of a licence key are "programming-language-safe", so the plain key value can be put into XML files or string literals without escaping. A licence key can be bound to some metadata, using asymmetric encryption. A bound licence key will only work if the metadata values found in the current execution context correlate with those that have been used to create the key. The following table shows the relevant information for each licence key metadata binding. You can use the Licence baKErY to determine the metadata of your application quickly. The computer login contains the name and domain of the user that is currently logged. This is the metadata of the product executable that is linking against the Tinman 3D libraries. On Windows, this information is accessible as part of the executable properties (right click -> Properties). For Visual Studio C++, the metadata values can be configured as a VERSIONINFO object that is stored in the executables resources. Licence keys are generated from the information found in licence requests. A licence request is a JSON text file (UTF-8 encoding) that contains all required information. 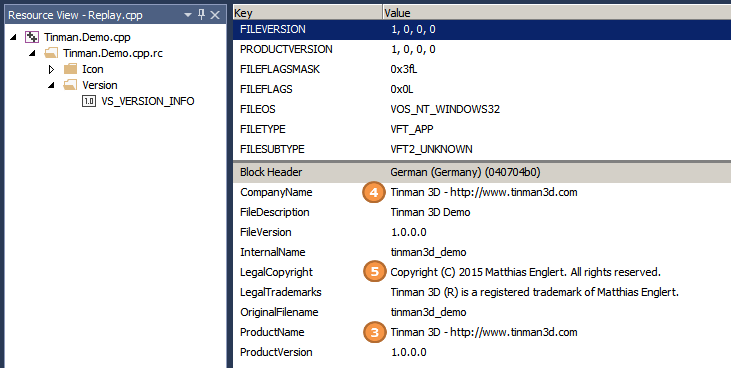 You do not have to deal with licence request files when ordering a licence for the Tinman 3D SDK. Only when submitting extra licence key requests you need to upload one or more licence request files. "Copyright": "Copyright (C) 2015 Matthias Englert. All rights reserved." Digitally licenced content, such as high-quality commercial raster datasets and texture pyramids. Use the Geodata Processor to apply an unlock key to a locked content archive.